Make your own writing set and personalise it as a gift.. This lovely writing set is made along the same lines as a card. 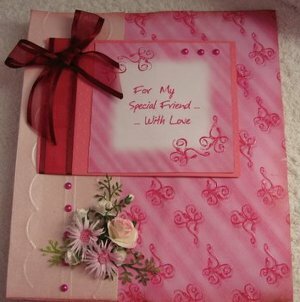 A hand made gift is always something that is treasured by the person who receives it and it can be for any occasion that you would like. This writing set would make a pretty gift for your daughter,especially if she is leaving the nest. Or your friend who may live some distance away. Or maybe as a special gift for your mum on "Mothers Day". In fact it could be for anybody for any reason. Just alter the colors to something more fitting if it's for a man. So let's get started making it shall we? 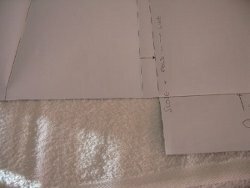 You will need two, matching, 29cm pieces of blank card. From the left hand side of one of them measure in 7.5cms and 9.5cms. 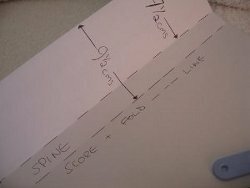 Score and fold both lines. This will produce the spine. If you are using patterned card then lay the card with the pattern face down. The dashed lines indicate the spine. 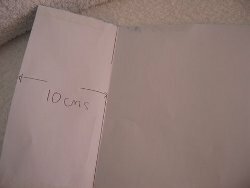 On the 7.5cm mark, line up the other piece of card and glue in place. 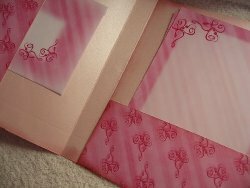 If using patterned card keep the pretty side facing you. It is better to use a wet glue as this is more secure than double sided tape. The last thing you want is for the writing set to fall apart after you have given it as a gift....Oh!No! Now open the two cards out, and you will have a really long piece about 50cms wide. From the bottom measure up 7.5cms. 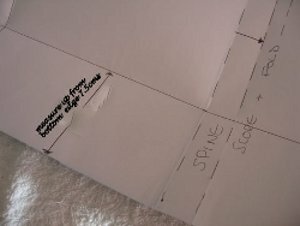 From the right hand dashed line of the spine cut up for the 7.5cms and then trim away all the card to the left hand edge. The photograph shows you what it should look like. 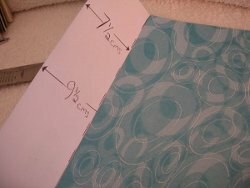 From the left side measure in 10cms, score and fold this piece inwards. So you now have two panels to hold the paper and envelopes. With a wet glue stick down the top and bottom edges of the right hand pocket. And the outside edges of the left hand pocket. Leaving the center of each free. You don't want to glue the whole section or the pockets won't be usable....not a good idea!! Now it's time to decorate the set to make it really pretty. 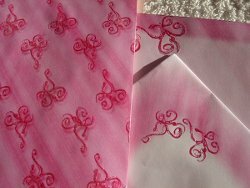 I printed out the backing paper, notepaper and envelopes form a CD from "Crafters Companion"
I picked out all the flourishes and embossed them with a clear powder. I have inked all the edges to the panels to add depth. And then comes the flowers....Yes! I added a big blob of "Pinflair Glue Gel" and just poked (technical term) all the punched leaves and the shortened flower stems into it. I added flat backed pearls along the front panel. Then I matted and layered a printed sentiment, wrapped it with some ribbon and added it to the front with foam pads. 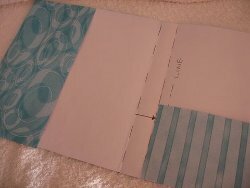 And last but not least...add the notepaper and envelopes. You may decide to use white stationery in your writing set, or some that matches the card. 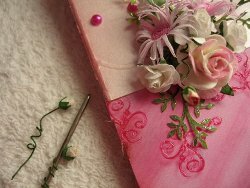 Another idea is to stamp some flowers or a flourish onto them and heat emboss that. Use your imagination to come up with some unique ideas to personalise your gift, the recipient will love it.